We’re bringing our BizApps community together for the first-ever Microsoft Business Applications Summit, *the* place for Dynamics 365, Power BI, Excel, PowerApps and Flow superfans to connect, collaborate and pack in as much learning as possible, July 22-24 in Seattle. Whether you’re a BizApps whiz or one in the making, this all-new conference has something for you. 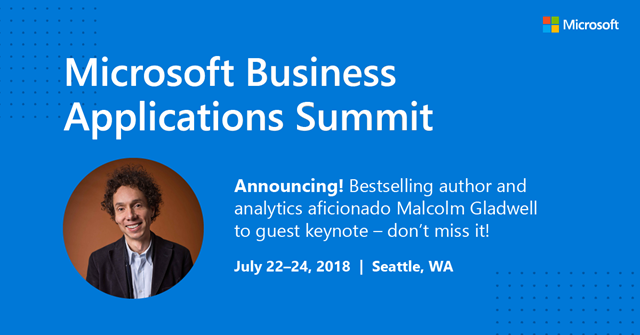 Hear from bestselling author and like-minded analytics aficionado Malcolm Gladwell in a special closing keynote. A pop-culture detective who uses data to drive insights about the everyday – and to uncover fads, trends and subcultures we never knew existed – Gladwell brings new clout to analytics and intelligence. He’s a 20+-year New Yorker staff writer with a deep affinity for data, and his 10-part podcast Revisionist History is currently in its second season. If we didn’t have you at “Gladwell,” check out our session catalog. You can explore all the sessions, workshops, breakouts and networking opportunities the event has to offer, and start outlining your best conference experience. Summertime in Seattle, exclusive access to expert insights, and a vibrant community of power users, analysts, architects and knowledge explorers: it doesn’t get much better. We hope to see you there!